My dog is really overweight. How do I know exactly how much to feed him? And what are the best snacks for him? Doctors have said humans do well to graze rather than eat big meals – does it work that way for dogs as well? Should I consider smaller meals and healthy snacks instead of two larger meals? you are feeding him. If your dog is on a dry food in which the “crude protein” mainly comes from carbohydrates (i.e. corn, potatoes, wheat, rice etc) and not meat protein sources, then you may want to look into changing his diet. Just like you and I, if we consume too many unnecessary carbohydrates our body will convert this into fat. Animal protein should be your dog’s main source of fuel, not carbs. A couple of brands that I have successfully used on overweight dogs (which are higher in animal protein vs. carbs) is Great Life Buffalo, Annamaet Lean and Fromm Gold Weight Management. I would also suggest adding can food to the diet. This addition of moisture gives the feeling of fullness without adding a significant amount of calories. Snacks for your dog may be green beans, cucumbers, a few pieces of chicken or turkey or opt to give him a nice meaty bone such as a beef femur to occupy his time. The idea here is; if you want to give your pup a treat, avoid the unnecessary carbohydrates that most biscuits contain or treats with hidden sugars (malted barley, molasses, glycerin, maltodextrin etc). If you are incorporating snacks just remember to reduce the amount of food given at meal time. 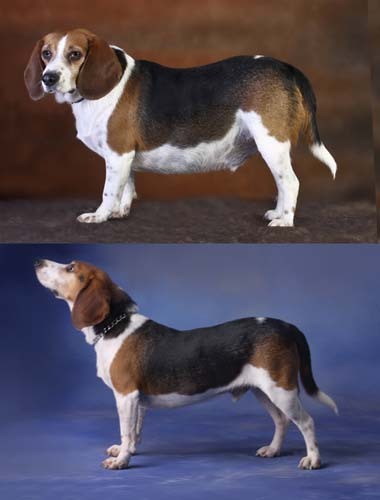 Each dog has a unique lifestyle, activity level, age and metabolic rate. Calculating exactly how many calories your dog needs is not easy. Putting your dog on a diet is no different than putting yourself on one. Take it slow and allow the body to adjust to the change. Quality of food is just as important (if not more) then counting calories. So look into the food your feeding and check its label for the amounts of carbohydrates and sugars it may be hiding.